This is a unique blend of The Famous Grouse to which rich Islay malt whiskies have been added. 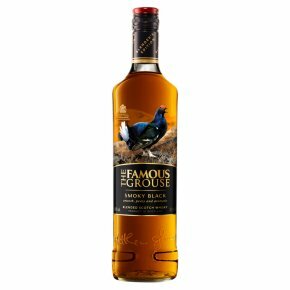 The smoky influence of the peated malts is balanced by the trademark smoothness of The Famous Grouse to create underlying hints of cocoa and spice. Dark, brooding and full of character. Smooth, peaty and aromatic. Blender's Edition No1 The use of a rare peated malt defines Smoky Black. It brings soft smoky notes to a smooth whisky with hints of sweetness. Our Blender's Editions showcase the art of whisky blending. For each edition our Master Blender selects a unique range of fine malt and grain whiskies to create blends with distinctive character. Smoky Black is the only blend in the world to use a rare peated version of Glenturret, from Scotland's oldest working distillery. Smooth and sweet with soft smoky notes. Smoky Black, one of a kind.